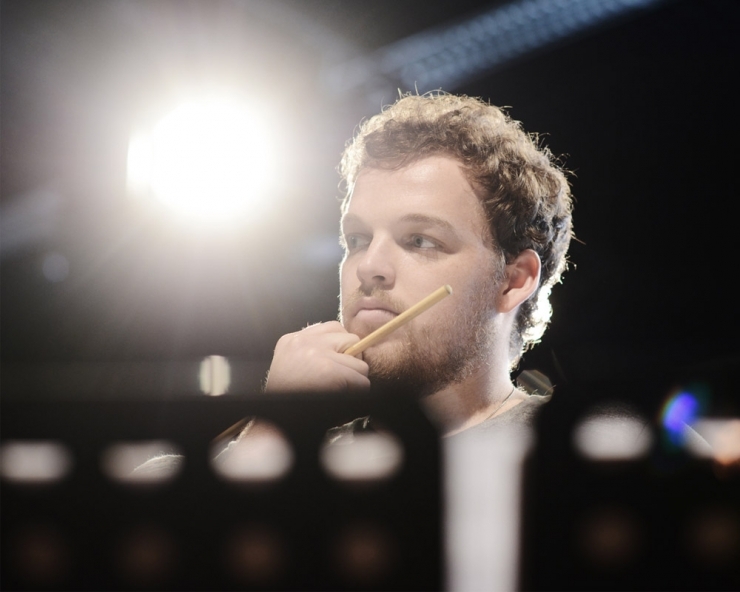 Twenty-eight year old Swiss vibraphonist and composer Jean-Lou Treboux started playing drums and percussion at the age of four. A few years later, touched by the rhythms of Western African music and attracted by the freedom of jazz, he commenced his studies in jazz vibraphone, this way he would have both rhythmical and melodical aspects of music. At the age of sixteen, Treboux was admitted at the Jazz Conservatory of Lausanne (HEMU), where he obtained a Master's Degree in Jazz Performance in 2011. During his studies, Treboux attended a large amount of masterclasses (Dave Liebmann, Adam Nussbaum, Miroslav Vitous, Mulgrew Miller, Antonio Hart, Jacob Sacks, Ari Hoenig, Chris Potter) but his most important encounter was in 2008 with vibraphonist Steve Nelson. In 2009, together with his fellow colleagues and friends, Treboux formed the Jean-Lou Treboux Group with whom he recorded two albums: December Rain in 2010, and Paths (featuring trumpetist Matthieu Michel) in 2012. The band performed in two of the most important Swiss Jazz Festivals (Schaffhauser Jazzfestival andCully Jazz Festival ) and won the Crédit Suisse Award in may 2011 and a special prize at the Jazz à Juan Révélation competition in 2012. From 2012 to 2014, searching for new inspiration, Treboux spent most of his time in New York where he studied with saxophonist Bill McHenry and performed frequently with great players such as Colin Stranahan, Rick Rosato, Arthur Hnatek, Craig Weinrib, Sam Yulsman, Danny Meyer, Ohad Talmor, Dan Weiss, Jacob Sacks, Sam Yulsman, Camila Meza, Jochen Rueckert, Sam Minaie, Roman Filiu, Greg Gisbert, Art Lande, Dean Johnson and Dave Miller. In 2013, Jean-Lou Treboux was selected to be part of the European Jazz Orchestra led by Swedish composer Ann-Sofi Söderqvist and toured for three weeks in Denmark, Belgium, Luxembourg, Switzerland, Portugal, Poland, Turkey and Sweden. Since his professional debut in 2006, Jean-Lou Treboux has performed in many festivals and jazz clubs around the world including in Europe, United States, Central America and Asia with many great musicians such as Eddie Henderson, Grachan Moncur III, Alvin Queen, Glenn Ferris, Sangoma Everett, Flavio Boltro, Guillaume Perret, Perico Sanbeat, Michel Benita, Jorge Rossy, Bill McHenry and Art Lande.